Gluten free. Suitable for vegetarians. Betty Crocker icings are ready to spread. Vanilla, chocolate or even buttercream icing: the perfect finishing touch for your cakes and all your baking. 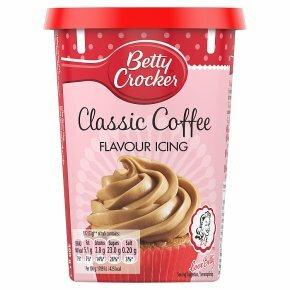 Betty Crocker icings are also gluten free. 3 steps to fabulous icing... 1 Pop the top - it's ready to use! Make sure it's at room temperature for the perfect finish. 2 Stir the icing with a rounded knife. 3 Spread or pipe onto your cooled Betty Crocker? cake for an instant beautifying treatment. Bake it yours For that final finishing touch, decorate with whole, halved or chopped walnuts - Delicious! Ready to spread Each tub contains enough icing to cover and fill an 8" cake (serves 12) or cover up to 27 cupcakes.